When you think of cameras, you don’t typically think of General Electric any more than you would think of Sony when deciding to buy a dishwasher. But GE does in fact sell digital cameras. GE’s A835 has a manufacturer’s suggested retail price of $110; you can easily find it from reputable online vendors for around $60. If you’ve finally decided to jump on the digital camera bandwagon, the A835 isn’t a bad choice, but for just a little more money you could get a camera that delivers better image quality. However, if money is absolutely the primary issue, $60 is hard to beat, and the A835 delivers a surprising amount of camera for this low price. 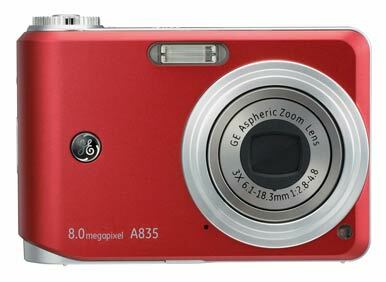 The A835 is an 8-megapixel camera with a 3X optical zoom lens. While a camera salesperson might tell you that more megapixels means better images, that’s not really true. With 8 megapixels, you can make larger prints (easily up to 13 by 19 inches) without losing image resolution. It also leaves room to crop your images so your subjects are better framed at typical snapshot sizes (4 by 6 and 5 by 7). The A835’s simple, basic design is small and boxy. The lens extends when you turn on the camera. The camera lacks any sort of grip or molding, which can make holding it a little difficult, especially if you have large hands. A small textured patch on the rear of the camera gives you a place to put your thumb, but it’s very easy to bump some of the control buttons accidentally. There’s no optical viewfinder, so you have to use the 2.5-inch LCD screen on the back to frame your shot. Unfortunately, the LCD is fairly dark and hard to see in bright daylight, and it also shows vertical streaks under bright light that can be problematic when you frame a shot. The back of the camera also sports simple controls, including zoom buttons and a four-way rocker switch. A mode dial sits atop the camera, surrounding the shutter button. The camera boots up quickly, and is ready to shoot as soon as the lens has fully extended, which only takes a second or two. The A835 supports a surprisingly full feature set. In addition to the fully automatic modes, it has modes that afford a little more user control, as well as a full set of scene modes for specific shooting situations and exposure compensation, useful to photographers who know a little more about how to manage exposure. The A835 has a 2.5-inch LCD. Like most cameras in this market, the GE hypes the A835’s smile-detection feature, which is supposed to only fire a shot when your subject is smiling. As is often the case, this feature doesn’t really work, though the camera’s face detection is good. First the good news: The A835 will definitely take better pictures than your mobile phone’s camera, so if that’s your normal way of shooting, this camera will definitely be an upgrade. The bad news is that the A835 has some image-quality issues. One of the easiest ways to make a camera affordable is to go with a cheaper lens, and GE must have saved a lot of money with this particular lens. Compounding the inherent weakness of the lens is the 8-megapixel sensor-it takes a very good lens to render fine details on an image sensor with 8 million pixels. The A835 does not render fine detail well, and it produces images that sometimes look mottled when viewed up close. It also suffers from an overall dingy appearance and a bit of a color cast. The camera offers ISO sensitivity up to 1,600, which means it can handle low-light situations very well. Surprisingly, the noise (grainy patterns in the image) doesn’t get too bad as ISO increases. While the camera offers a 640-by-480-pixel movie mode, the results are terrible-pixelated, with bad metering and weird color artifacts. If video is important to you, this camera will frustrate you. If saving every penny is your primary consideration, you’ll find the A835 a decent snapshot camera for the price. It’s relatively small and definitely easy to use. If you want good image quality, you should spend the extra money for a camera like Canon’s PowerShot A470 ( ).